As I’ve stated in previous posts, I mainly focus on macro, nature and some travel photography. One of the reasons for this is that I find it uncomfortable to take pictures of people. Making someone the center of attention and then recording that experience through my pictures hasn’t been the most appealing of prospects. With macro and nature shots, the subject is either inanimate or isn’t thinking about having their picture taken. And with travel shots, it’s usually in a public spot with many people taking pictures so no one thinks twice about it. What I realized, was that even though I feel this way about taking people shots I really enjoy looking at them and wouldn’t mind having some in my portfolio. So I gave it some thought and drew some inspiration from one of the photographers I follow on Flickr that does some great street photography (his name is Mike, check out his photostream here). I really love the moments he captures and thought street photography could present a good first step into capturing people shots. This is not to minimize the work he does, it is only my thought process that if I go to busy places, I won’t be so noticeable standing there taking pictures. Maybe over time, I will be able to recognize those moments like he does. So now that I settled on what I wanted to do, I needed to think of a good place to do it. I thought of the Green market in Union Square and brought my camera and went up. I chose this place because it is filled with both tourists and locals, many of whom are toting cameras and taking their own pictures. So I knew I wouldn’t stand out. I arrived there and put the camera to my eye and started to take some shots. I looked for lulls in the crowd were I might be able to capture only a couple of people, instead of a mass of them. The first couple of shots felt odd, especially to be aiming my lens directly at someone. I kept thinking, “they’re going to look right at me and then get angry that I was taking their picture”. But to my surprise most people were so caught up in their own thoughts that they didn’t even give me a first glance. Of course, i tried not to stay on any one person for too long though. The lens I have is a zoom lens that goes from 18mm – 200mm, so I kept having to zoom in which added to my anxiety of getting “caught”. 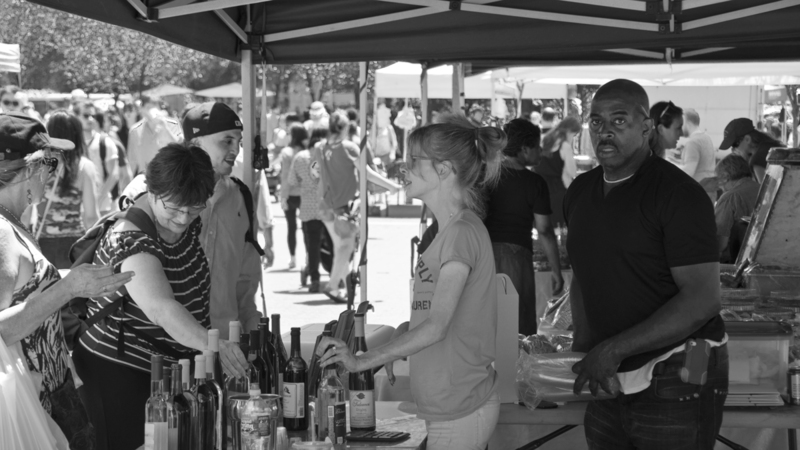 Towards the end of my shoot, I decided to take a few pictures of some vendors busy with patrons. I figured they would be too busy to notice me and are probably used to having their pictures taken. There was this one vendor that had a nice line in front, I guess it was because they were selling wine and were giving out samples. Go figure people would line up for that, right? I took a couple of shots but one of the workers kept getting in the way of the person I was most interested in getting. When he finally got out of the way, he looked up and straight at me. “Oh crap!” I thought. He’s got me dead to rights. He tapped on the shoulder of the woman I was making the subject of my shot and pointed right at me as he whispered something to her. I was like a deer in headlights, I wasn’t sure what to do. So I approached and told them I was just taking some candid shots of the market. He seemed to think I was a tourist and asked me where I was from. I told him I was actually from here. He then went on to inform me that people usually ask before they take photos implying that I had broken a rule. Did I? perhaps. I told him that I prefer to ask after so that I would be able to get more candid shots. He seemed to buy that. The experience was a bit nerve racking but not all that bad really. I had survived my first real attempt at taking pictures of people I don’t know and am none the worse for wear from it. I think I’ll have to try it again.